I feel reflective today. I can’t move forward on my to do list, distracting myself with a computer game or housework isn’t making it go away, so I’m honouring the feeling by letting it speak through my fingertips in this post. The most powerful drive in the grateful reflectiveness is in how strongly I sense that God has me doing and learning a kind of pastoral work that is quite well suited to my interests and character, nurtured well by my backstory (somewhat especially by the difficult parts), and how this work is a clear need in the church local and at large. Being in that kind of place vocationally, calling-ally, is a weighty, light-of-heart making privilege. Earning a full paycheque again after four years of underemployed subsistence living — some of it in a paradise that I miss deeply some days — well it ain’t so bad either. Somehow the equation always balances. 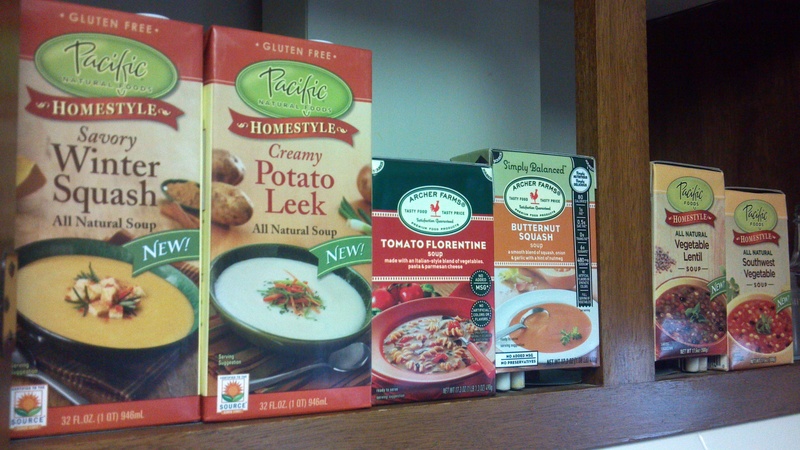 Good soup filling the cupboard... All's souper! The downside is not big enough to unbalance the situation — otherwise I’d need to make a change. So too, now, the downside of distance is not dissonant enough to be hugely disturbing, largely because technology eliminates much of the geographic distance. Other distances would be there even with physical proximity, so geography does not matter. So it is interesting to me too that this blog is the place I felt it most appropriate to express this. Thoughts of sharing it on other popular social media felt like a cheapening. Hmmm. As it is I struggle more and more with my involvement with those places. I do not like how much information I ‘give’ them in order to get a ‘free’ service that I am feeling more and more has price that I can’t yet see. I am letting them analyze me, box me in, and feed me ads that are supposed to be tailored to my interests, but when they show up I am creeped out. Is it really free if they have chosen what I see because their alogarythm thinks it knows the beat of my inner heart? Doubt it. I certainly resent that they believe so. Anyway, I can blog about that another time. I’ve said the main thing I set out to say. God has me in a good spot work-wise and for that I’m grateful. There’s more narrative and substance to that feeling, but that’s what the button called “New Post” and the blank page is for that comes after pressing it.